I recently completed a review comparing Kaplan vs. Princeton Review. That left me wondering how these test prep providers would stack up against the new kid on the block for paid test review, Magoosh. 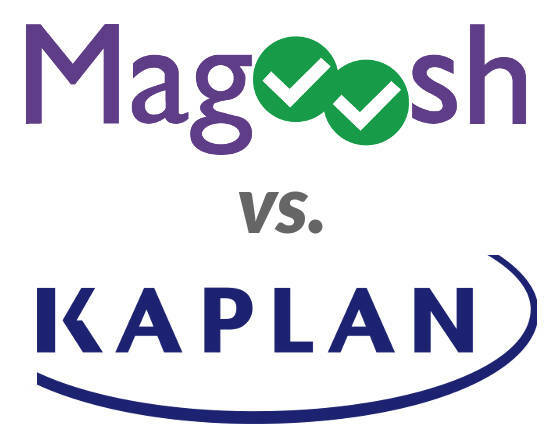 Kaplan and Princeton Review have been fighting it out for decades, but Magoosh has only been around for about 10 years. Probably the most interesting comparison is the idea of putting Kaplan against Magoosh. Kaplan is, after all, the original test prep provider, having been established in the 1930’s. That’s a huge head start on the competition. Magoosh, on the other hand, comes to us from the modern American center of gravity in Silicon Valley. I wanted to see how the upstart fared against the established Goliath. I put Kaplan and Magoosh to the test in several popular categories. Magoosh is exclusively available in an online, self-paced format. If you are looking for a classroom or live online experience, Kaplan is the better option. Kaplan offers live, online tutoring with many of their classes. Magoosh offers email assistance, where you can send a question in and get a response sent back to you. In most cases, Magoosh is a lot cheaper than Kaplan. Magoosh has mobile apps designed specifically for each course they offer, and they are usually, though not always, better than Kaplan’s app experience. Magoosh offers a 7-day free trial with all of their classes. Kaplan offers free events, where you can see what a class is like. Kaplan tends to offer more content with their classes, like videos and practice tests, than Magoosh. Whichever option you choose, you need to feel comfortable with the teaching style these instructors use. That’s why in addition to their free samplers, I’ve included a link to samples of their videos on YouTube below. OK, with these notes about their high level differences in mind, lets take a look at these two competitors on some specific tests. Magoosh’s mobile apps are specifically designed for GMAT prep, and they are better reviewed than Kaplan’s. Magoosh includes email tutoring with GMAT packages, video tutoring as an upgrade. Kaplan requires an upgrade for tutoring. Magoosh guarantees a score increase of 50 points (Premium), while Kaplan just guarantees a score increase. Magoosh has a free 7-day trial of their service. Kaplan has free events to try out their service. Magoosh offers 2 practice tests (Premium). Kaplan offers 9 practice tests and their “Test Day Experience,” which allows you to take a GMAT practice test at the actual testing facility, perfect if you have test anxiety. Kaplan includes 2 GMAT prep books and an MBA admissions guide. Magoosh doesn’t offer prep books. So… Kaplan or Magoosh on the GMAT? I’m giving the nod to Magoosh here. Their GMAT prep is actually one of their most innovative and high rated courses. You can tell that Magoosh has gone all in on the GMAT. They actually offer video tutoring as part of their Guided Study package, the only course where they currently offer video tutoring. Their 50 point score increase guarantee is also very generous. Click here for a 7-day free trial of GMAT review with Magoosh. Magoosh’s mobile apps are specifically designed for GRE prep and better reviewed than Kaplan’s. Magoosh includes email tutoring, but Kaplan requires the purchase of a tutoring package to get individual support. Magoosh guarantees a score increase of 5 points. Kaplan just guarantees a score increase. Magoosh offers a 7-day free trial. Kaplan offers free events to try out their service. Kaplan offers 7 practice tests vs. Magoosh’s 3. Kaplan also offers a unique “Test Day Experience” which allows you to take a practice test at your actual GRE facility, perfect to work our nerves if you have test anxiety. Kaplan offers 4 GRE test prep books while Magoosh offers none. So… Kaplan or Magoosh on the GRE? Magoosh is also well known for their GRE prep, and rightly so. At a substantial discount over what you pay with Kaplan, you get a premium self-paced experience, particularly for those that want to review via their mobile phones. Here the advantage goes to Magoosh. Click here for a 7-day free trial of GRE review with Magoosh. Magoosh’s mobile app is specifically designed for SAT / ACT prep and better reviewed than Kaplan. Magoosh guarantees a 100 point increase on the SAT and 4 points on the ACT. Kaplan just guarantees an increase. Kaplan offers 8 practice tests to Magoosh’s 3 practice tests. Kaplan offers 3 hours of 1 on 1 tutoring. Magoosh offers email assistance. So… Kaplan or Magoosh on the ACT / SAT? In this case I’m making a conditional recommendation for Magoosh. The difference in cost between Magoosh and Kaplan isn’t as great on the high school tests as the grad school tests. However, the “study from your phone” approach will appeal to a lot of high school students. You just have to make sure that your child is disciplined enough to stick with it. Kaplan does offer more study materials such as the 8 practice tests, but a lot of times 17 year olds don’t yet have the study habits to utilize them. I recommend signing up for the 7-day free trial that Magoosh offers, and if that works well, staying with them. You always have the option to cancel and go with Kaplan. Click here for a 7-day free trial of Magoosh SAT or ACT review. Kaplan has 15 practice tests vs Magoosh’s 3. Kaplan includes 3 hours of 1 on 1 tutoring w/Self-Paced Plus and higher options. Magoosh offers email assistance. Kaplan includes 7 MCAT prep books. Magoosh does not include MCAT prep books. Kaplan offers substantially more video review content. Magoosh has a better mobile app. Magoosh guarantees a 10 point score increase while Kaplan just guarantees a score increase. Magoosh’s prices are much cheaper, depending on the package chosen, hundreds to thousands of dollars less. So… Kaplan or Magoosh on the MCAT? So there’s no question that the contrast between these two test prep companies is more pronounced than anywhere else on MCAT prep. You are going to have to decide what’s important to you, having the more complete experience (Kaplan), or saving the money on test prep (Magoosh). Because while Magoosh is much cheaper, it is lacking in a lot of thorough review features that Kaplan has. If you’re reading this, you probably know that just a few points on the MCAT makes the difference between dropping from the top 10% to the top 25% to the top 50%. Kaplan has actually done a blog post showing what a big impact these 5 point drops have on med school admission chances. Given the importance of getting into the right med school has on future earning potential, I’m going with Kaplan for the MCAT, but I wouldn’t fault you for checking out Magoosh. Click here to check pricing for MCAT review with Kaplan. Kaplan offers LSAT prep books and Magoosh doesn’t. Kaplan offers a whopping 80 practice tests, while Magoosh offers 500 practice questions, and no full length tests. Kaplan offers far more on-demand video content. Kaplan includes 2 hours of 1 on 1 tutoring with their Self-Paced PLUS and higher plans compared to email assistance from Magoosh. Magoosh’s score guarantee is more generous, guaranteeing a 5 point increase. Kaplan just guarantees an increase. So… Kaplan or Magoosh on the LSAT? Magoosh isn’t as polished on the LSAT as they are on most of their other test offerings. Their app reviews are lower, their content is less, and they seem to still be figuring their way forward. If you are headed to the high stakes world of law school, you don’t want to leave this one to chance; go with Kaplan. Click here to check pricing for LSAT review with Kaplan. * Not all options available with every package. Packages subject to change. See Magoosh or Kaplan websites for current details. Numbers based on self-guided packages.